The purpose of this research was to summarize existing nondestructive test methods that have the potential to be used to detect materials-related distress (MRD) in concrete pavements. 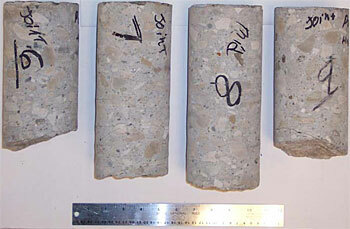 The various nondestructive test methods were then subjected to selection criteria that helped to reduce the size of the list so that specific techniques could be investigated in more detail. The main test methods that were determined to be applicable to this study included two stress-wave propagation techniques (impact-echo and spectral analysis of surface waves techniques), infrared thermography, ground penetrating radar (GPR), and visual inspection. The GPR technique was selected for a preliminary round of “proof of concept” trials. GPR surveys were carried out over a variety of portland cement concrete pavements for this study using two different systems. One of the systems was a state-of-the-art GPR system that allowed data to be collected at highway speeds. The other system was a less sophisticated system that was commercially available. Surveys conducted with both sets of equipment have produced test results capable of identifying subsurface distress in two of the three sites that exhibited internal cracking due to MRD. Both systems failed to detect distress in a single pavement that exhibited extensive cracking. Both systems correctly indicated that the control pavement exhibited negligible evidence of distress. The initial positive results presented here indicate that a more thorough study (incorporating refinements to the system, data collection, and analysis) is needed. Improvements in the results will be dependent upon defining the optimum number and arrangement of GPR antennas to detect the most common problems in Iowa pavements. In addition, refining high-frequency antenna response characteristics will be a crucial step toward providing an optimum GPR system for detecting materials-related distress.